Welcome your guests with these beautiful appetizers. 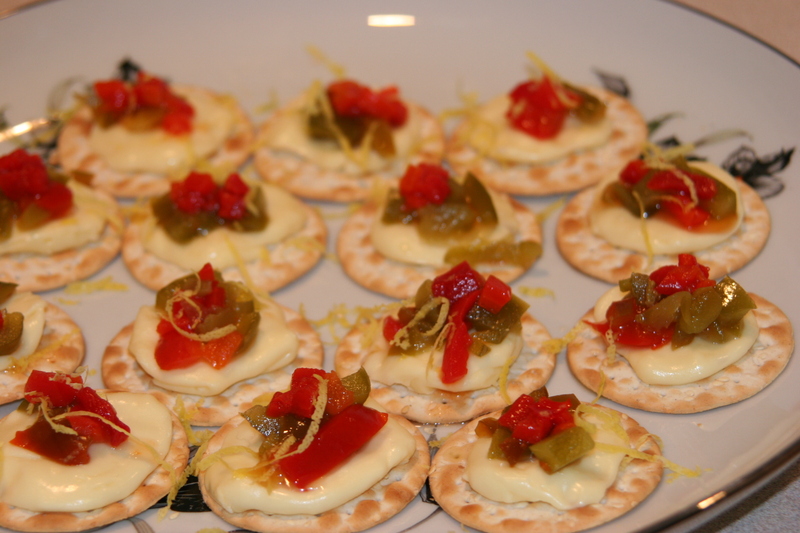 Spread brie, camembert or plain cream cheese on crackers and top with red pepper relish and lemon zest. Here’s in translation Vicky’s recipe for red pepper relish. How to make: Mix the peppers with the salt and let the mix stand for 4 hours. Prepare the syrup by boiling the vinegar and sugar at high heat. Add the peppers with their liquid in the syrup and continue boiling at high heat until the syrup thickens. Here’s the readiness test: drop some syrup on a cold plate and run your finger through it. If the two parts do not come back together immediately, the syrup is ready. Put the mix in hot, sterilized jars. Pour more liquid from the syrup so the peppers have enough syrup in the jar. Close the jars with warmed lids and let the jars stand upside down until they are cooled off. You can keep the relish for a year. Opened jars must be kept in the fridge and they can last for about a month. Αυτά δεν τα σχολίασα αλλά δείχνουν τέλεια. Και οι πιπεριές είναι πιο ζωντανές από τις δικές μου!